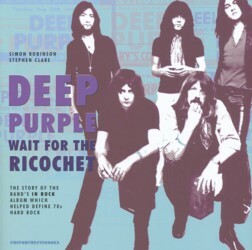 Hugely entertaining and skilfully researched, ‘Wait For The Ricochet’ – the clue’s in the title – tells the story behind the making of ‘Deep Purple In Rock’, the album that finally put the band on the road to the top. Coming after three patchy, poppy, platters and the often mis-understood ‘Concerto For Group And Orchestra’, ‘Deep Purple In Rock’ turned the band into a household name, spending 68 weeks in the UK charts and also giving rise to (as a direct result of the age-old management cry of ‘where’s the hit single?’) a hit single in non-album cut ‘Black Night’, recorded as a drunken afterthought and all the better for it. As engaging as it is instructional (even the title can be taken two ways – as a direct reference to a lyric from ‘Child In Time’ or a more oblique allusion to a working title for ‘Speed King’), ‘Wait For The Ricochet’ might be a little too detailed for the casual listener as, for example, the songs are dissected to their very chord structures. That said, the exploration throws up some fascinating nuggets, like the fact that there were thirty-one takes of ‘Cry Free’ – far more than any other song – before the band were happy with it, and even after that it still remained in the can until Deep Purple Appreciation Society mainman Simon Robinson discovered it for the ‘Powerhouse’ compilation in 1977. However, what does shine through is the determination of founder members Ritchie Blackmore, Jon Lord, Ian Paice and newbies Ian Gillan and Roger Glover to craft an album like nothing that had gone before, despite the fact that it had to recorded in piecemeal sessions over a time-frame of six or so months so that gigs could keep the financial wheels oiled; not an ideal way to work, certainly, but the results, released in June 1970, were nothing short of stunning. There’s a few typos which should have been ironed out but nothing which the spoils the driving narrative. To find out more check out www.easyontheeyebooks.wordpress.com or turn up at your local bookshop with £17.99 in your hand.